Situated in St John’s Wood, to the north of Central London, St John and St Elizabeth is one of the most respected independent private hospitals in the UK. 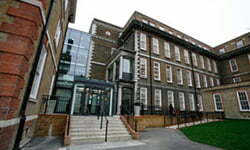 The main entrance to the Hospital of St John and St Elizabeth is at 60 Grove End Road. We are just three minutes walk from St John’s Wood Underground Station (Jubilee Line). Bus numbers 13, 46, 82 and 113 pass along Wellington Road. The nearest stop is just before St. John’s Wood Underground Station. Bus numbers 46 and 187 go along Circus Road. The bus stop is close to the Hospital’s Circus Road entrance. Bus numbers 189 and 139 go along Abbey Road. There is a small car park available on-site next to the front entrance on Grove End Road (free parking for up to two hours). There is also an NCP car park nearby on Acacia Road.